This is the façade of the royal mint in Potosí, Bolivia. The Casa de la Moneda turned silver from the mines into silver ingots. Its location, at the center of town and just off the main plaza, reinforces the crucial role the mint played—both literally and symbolically—in enriching not only the Americas but all the Spanish realms. The mint’s portal resembles the exteriors of several church buildings in Potosí. It is thus visually linked to other buildings across the city. At the top of the portal are the coat of arms of Castile and Leon, a tower and a rampant lion. The distinctive style of the columns repeats on both tiers, above at smaller scale, visually unifying the façade. All of the royal mints in Spanish America were built under the auspices of the Spanish Crown. In Potosí, Tomás Camberos and Salvador Villa, both architects born in Spain, were largely responsible for the initial work on the Casa de la Moneda. After Villa’s death, the work was continued by Camberos and Luis Cabello, who had worked on the royal mints in both Lima and Mexico City. The façade seems to have been overseen by Pedro Tagle who was not trained as an architect but served in Spanish America as an administrative official. As with all of the important buildings in Potosí, the Casa de la Moneda was constructed of stone. Its interiors also used wood and glass. Rebuilding was not uncommon, and this 18th-century building replaces a 16th-century structure (on a different site in Potosí). 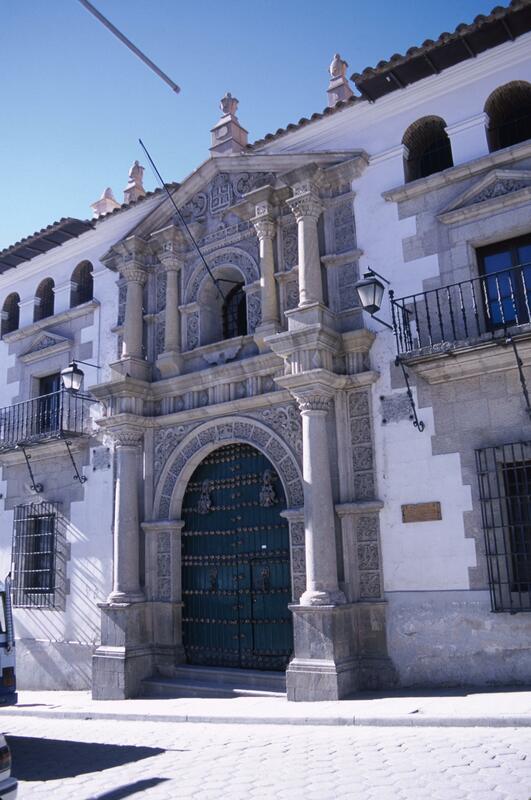 Today the Casa de la Moneda is a museum, dedicated both to the history of mining in the region and a repository of artworks, including paintings and silverwork, from Spanish America. This was both a factory serving royal interests and physical sign of the economic and political health of the Spanish crown. The wealth of Potosí’s mines was famous and highly coveted world-wide in the early modern period. 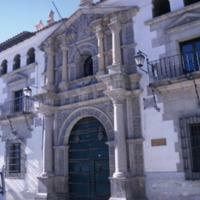 As the working site where the riches of Cerro Rico’s mines were converted into useable coinage, the Casa de la Moneda was guarded by many a colonial official. It was also a building whose symbolic meanings and products spilled well beyond the city streets of Potosí and the oversight of any representatives of the Spanish crown.